The Connected Learning Space . Published 2009 . Publisher: Association for the Advancement of Computing in Education (AACE). that reduce the complexity of documents intertwining even without bothering the learner. 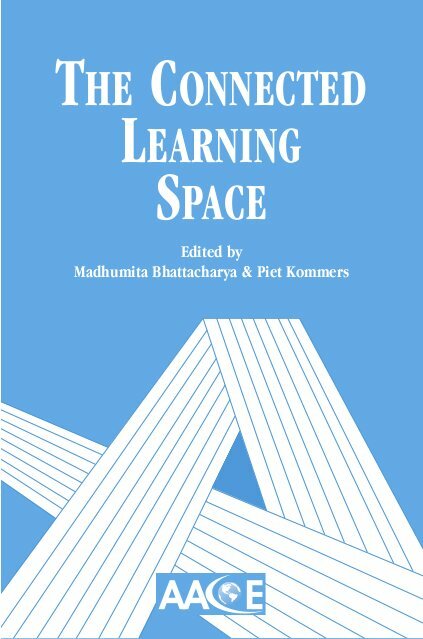 M. Bhattacharya & P. Kommers (Eds.). (2009). The Connected Learning Space . Association for the Advancement of Computing in Education (AACE). Retrieved April 22, 2019 from https://www.learntechlib.org/primary/p/30471/. Anderson, T. (2005). Theory and practice of online learning. In T. Anderson and F. Elloumi Eds. Toward a theory of online learning (chp.2). Athabasca University, Canada’s Open University, Creative Commons. Http://cde.athabascau.ca/online_book/ Banathy, B.H. (1998). Designing education as a social system. Educational Technology, Nov-Dec., 51-56. Gay, G. (2002). Preparing for culturally responsive teaching. Journal of Teacher Education, 53, 106-116. Gazda, G. Ginter, E., & Horme, A. (2001). Group counselling and group psychotherapy. Boston: Allyn & Bacon. Oubenaissa-Giardina, L. (2005). E-learning design: Learning modes, pedagogical principles, and educational designing skills. In Richards, G. (Ed. ), Proceedings of World Conference on ELearning inCorporate, Government, Healthcare, and Higher Education 2005 (pp. 22702273).